ACM CECL is happy to support registration costs for people from the European chapters community to attend the “Mensch-Sein mit Algorithmen/ Being Human With Algorithms” symposium in Heidelberg. 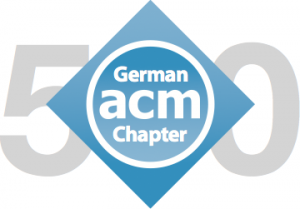 This exciting event is organised by the German Chapter of the ACM as part of the celebration of their 50th anniversary. We are delighted to be offering 15 awards to cover the registration fee for fifteen people to attend the symposium. We warmly encourage people from the European chapters community interested in attending the symposium to apply. The award will be paid directly to the symposium (not to the candidate) and award winners will receive a registration confirmation. All other costs incurred by candidates attending the symposium must be covered by themselves. We will assess applications for these awards covering registration costs through a competitive process. Priority will be given to young people and people from underrepresented groups. Please use the following application form. The deadline for applications is July 31st, 2018.